Happy Friday, everyone! Here's a bonus review for anyone who has dogs. (It's really just an excuse to throw that hot keyword "pumpkin" out there a few more times before the human pumpkin foods roll in.) I mean, sure, Russ has found a few "harvest" items lately, but they're nothing like the "p-word" in terms of search engine love. So here we go, PUMPKIN! 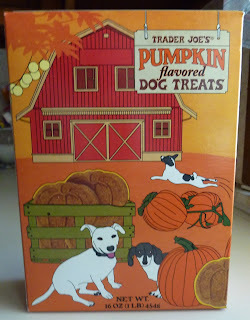 Like other Trader Joe's brand pet treats, Alfred and Sadie loved these. They're too big for small dogs and they're super hard, but our hounds couldn't care less. Also, they don't taste much like pumpkin at all. Do the dogs know that? Do they care? Probably not. Just watch the video. Sorry for the run-and-gun-style shooting, shoddy editing, and poor sound quality. But hey, there are cute puppies and pretty fall pumpkin treat things. Plus, I eat dog food! Again! For those of you pining for human pumpkin food, hang on, get ready, and stay tuned. There's a pumpkin storm coming that will utterly blow your mind! If you're interested in the nutrition info for this product, just click here. Bottom line: 7.5 out of 10 paw prints. Thanks, MG :) Not quite as tasty as they look, for humans at least. Your dogs are adorable! I had to come here and post that I just saw an article at HuffPo that Trader Joe's now has Pumpkin Spice Cookie Butter! They say it's made by an angel as it is magnificent! Well I wouldn't trust anything couldn't eat myself to feed to my dog, so you're hardly insane, Your dogs are cute! I like the video reviews. When in my late teens, I once tried a Purina Cat Chow piece since the cat was so wild about it that she would rip open the box or bag if it was left unattended for even a few seconds. I was still baffled by her enthusiasm, it was pretty meh to me. Some mysteries are best left unsolved. Pumpkin is actually pretty good for cats and I imagine also dogs, gives them some fiber and other good stuff and they usually like it. Humans probably associate so strongly with the sugar and spices added to pumpkin for us that we might not react the same. I like acorn squash by itself usually, though, so who knows? Pumpkin is really good for a dogs digestive tract, usually allergen free and they love it. My dog does this too Patrick. Carries it around whimpering, then tries to bury it in his bed or blankets on the couch!